I really want to get a german shepherd but am concerned about the shedding. I formerly had a siberian husky so I am no stranger to grooming and heavy seasonal shedding. However, the huskie was primarily an outside dog whereas I expect my next dog to be an inside one. My question is if I brush my shepherd down on a regular basis will it still be common for my house to be covered in hair? Terry is right, GSD's are known to be heavy shedders and blow their coats twice a year. My Kota is a long-coat, and when I got her, her fur was in awful condition. It was dry, and she had many hot spots and was always scratching. The vet thought she had contact environmental allergies and put her on Benadryl and another med. As a Service Dog, I could not use Kota because of the side effects. I tried changing her food often. I did some research and decided to try raw. I can't stand the sight of raw meat, so I started using Nature's Variety raw frozen diet. Not too long afterwards, she quit scratching, the hot spots disappeared, and her coat was shiny and fluffy. I brush Kota everyday, lightly with the Furminator, then with a bristle brush, then a soft brush. Since I started her on the raw, the quick daily brushing is all I need to do. As a Service Dog, she HAS to look good in public, so she also goes to the groomer for a shampoo every 3 months. She has not blown her coat during those seasons, and I have very little hair in the house. I believe the raw diet, not having any grains or additives in it is the reason she now has such a beautiful coat, that is easy to maintain. You are in luck...gsds shed only once a year. It lasts about 365 days! lol. Seriously, though, they shed a lot. Daily brushing will help, and using a combo of an undercoat rake once a week and a good brush daily will help. Make sure the brush is not too harsh or you can strip the natural oils on the skin or irritate it. The furminator is fantastic, but again, don't go overboard. I do the furminator, or undercoat rake, followed by a bristle brush, followed by a comb, followed with a soft brush once a week. Midweek I omit the raking but do the remaining tools, followed with a lovely doggie massage. It's a great way to know if there any sore spots or just not right things going on. With the new double sided brushes on the market one or twice a week will take care of 98% of the shedding. but there is no dog like a GERMAM SHEPHERD!Do not pass up an experience of a life time. Just set rules,boundries and limitations in the house and crate train your GSD. There are excellent dander and hair products on the market also. GSD must have a strong pack leader and need excerised daily. The walk is very important in establishing your role as a pack leader.GSD love to be challenged. 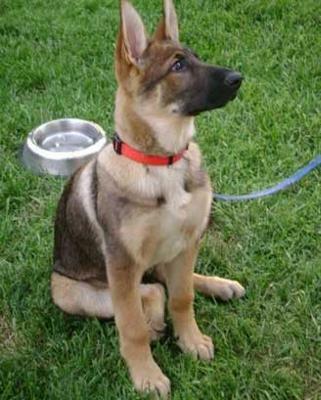 There are outstanding dogs but only one can be called GERMAN SHEPHERD because they are the BEST.